Perfect for patios, balconies or backyard gardening. 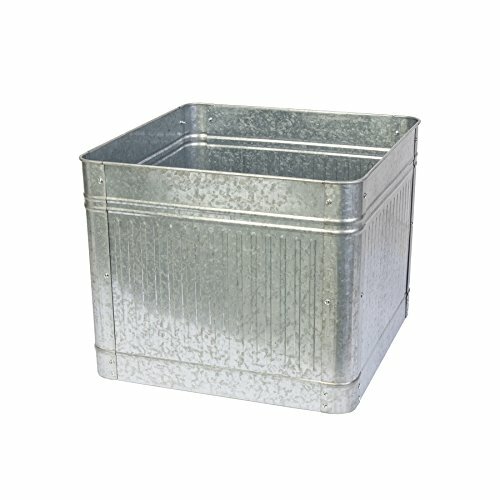 Easily grow tomatoes, vegetables, herbs or your favorite flowers anywhere you want.These unique raised bed planters look like galvanized watering troughs, but they are durable embossed metal that easily bolts together. Choose a level, sunny spot, fill with dirt (or pots), plants and seeds. Cut down on maintenance, like watering and weeding with this compact garden. Less weeding, low maintenance and simple to set up! COMPACT YET GENEROUS GROW AREA: Assembled Size is 22 in. Wide x 18 in. High x 22" Deep. Planting Depth is 18 in. CAPACITY: Holds 5 Cu. Ft. of soil. CHOOSE A SPOT AND PLANT: Choose a sunny spot on patio, balcony or yard, fill with dirt (or potted plants), plants or seeds. SIMPLIFY PLANT MAINTENANCE: Raised beds keep your plant area defined, require less weeding and watering and deter hungry critters. If you have any questions about this product by Panacea, contact us by completing and submitting the form below. If you are looking for a specif part number, please include it with your message. Greenes Fence Cedar Raised Garden Kit 4 Ft. X 8 Ft. X 7 In.